Church could be, and should be, but often isn’t, a school for learning how to talk. 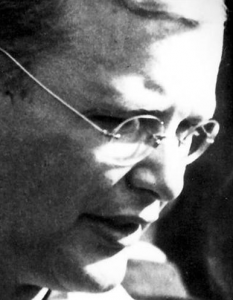 I love Dietrich Bonhoeffer’s thought – that just as a child learns to talk by observing and mimicking the parent’s talk, we learn to pray by soaking up God’s word in Scripture so we’ll know what to say to God. How do Christians talk? I’m not sure we are 17% nicer, or that the Christian is the one who avoids cussing. Maybe we know words matter, so speaking truthfully matters, and speaking words that build up instead of tearing down matter. Bonhoeffer said Never talk about someone not in the room. I’d say you can, but only if you’re praising that person. Refraining from words is a Christian thing – although silence can be cruel, and being silenced is painful. But listening is our default mode in conversation – and when pondering the troubles of the world. Instead of spouting what I know would fix others, maybe I listen to them, or just sigh with them in pain. Christians are called to be encouragers, and we are all capable of offering way more of it. And then just whether our words uplift or tear down, are holy or wasted: Paul said “Whatever is true, honorable, just, pure, lovely or gracious, if there is any excellence, if there is anything worthy of praise, think about these things” (Philippians 4:8). And speak of them as well. Church matters, because our words matter – now more than ever, in our world where talk is cheap, harsh, harmful and foolish.